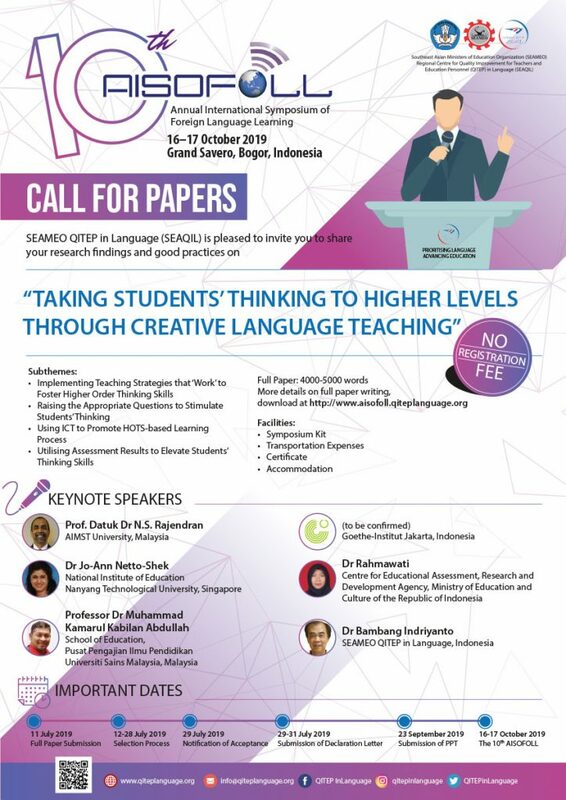 SEAMEO QITEP in Language (SEAQIL) is pleased to invite you to the tenth Annual International Symposium of Foreign Language Learning (the 10th AISOFOLL) on 16–17 October 2019 at Grand Savero Hotel, Bogor, Indonesia. 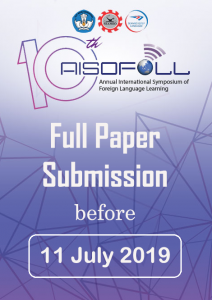 The symposium will bring together language teachers, educators, researchers and public from Southeast Asia region to have an in-depth discussion on “Taking Students’ Thinking to Higher Levels through Creative Language Teaching”. Thus, the symposium will facilitate you to share and exchange information on (1) Implementing Teaching Strategies that ‘Work’ to Foster Higher Order Thinking Skills, (2) Raising the Appropriate Questions to Stimulate Students’ Thinking, (3) Using ICT to Promote HOTS-based Learning Process and (4) Utilising Assessment Results to Elevate Students’ Thinking Skills. By having well-known experts as keynote speakers, interesting presentations as well as fruitful and engaging discussion; the symposium will surely give you an invaluable experience. The symposium will also give you the chance to expand your professional network. Come and make yourself part of HOTS community!